During an incident involving dangerous chemicals, the emergency services and local residents must as soon as possible be informed about the nature of the incident and the extent of the possible danger area. The PC program GasMal developed by TNO provides support to this process. In the 90’s, the regional fire service’s Warning and Monitoring Service (WVD – Waarschuwings- en Verkenningsdienst) played an important role during incidents which involve dangerous chemicals in The Netherlands. The WVD consisted of a WVD expert who controls a number of monitoring teams equipped with relevant monitoring and communications equipment. The results obtained by these teams enable the WVD expert to warn local residents about incidents via a network of sirens. To help the Warning and Monitoring Expert to estimate the size of the area under threat, there is a ‘Red Case’ containing a variety of aids. These include a Worksheet, issued by the DCMR Environmental Service in Rotterdam Rijnmond and the Dutch Fire Academy (Nibra), which has been used for a considerable time during incidents involving dangerous chemicals. The work sheet’s user answers a number of questions related to the incident and the chemical involved which results in the selection of one of the concentration templates. These are cigar-shaped contours printed on a transparent sheet that the user can place on a map of the incident area. To reduce the chance of errors when answering the questions and also to improve the presentation of the results TNO has developed GasMal, an automated version of the procedure. GasMal combines computer speed with a graphical display and a number of extras including the display of relevant information on the map and the possibility of creating telephone lists, descriptions of local companies, etc. The core of the user interface, which enables the user to communicate with GasMal via the computer screen, is the electronic version of the Work Sheet. On this screen, the user can define the characteristics of the incident. Therefore the following functions are offered: deduction of the colour and the number of the ‘Red Case’ template, presentation of a preview of the deduced template and production of hard copies of the on-screen situation. The data items that need to be entered are in a logical sequence from top-left to the bottom and subsequently to the top-right: meteorological data, chemical data and the emission data leading to the incident preview. During an incident, data can also be stored for later evaluation purposes. The calculation module determines the concentration template or sector based on the location of the incident, the toxic chemicals involved and the weather conditions. This module also calculates the progression rate of the gas cloud and thus enables the display of the results as minute lines. The data files include data for dangerous chemicals with their characteristics. These characteristics concern physical data, such as their vapour pressure, but also data that are important e.g. to warn or to evacuate the population. Because the template selection mechanism has been based on a categorisation and because it gives only a theoretical estimation of the concentration, the best method is to check the GasMal results with the concentrations that are measured (e.g. by using Dräger tubes) by the monitoring units. The measured values can be put into GasMal. Subsequently, the program will provide a feedback whether the measured values are relatively high or low. 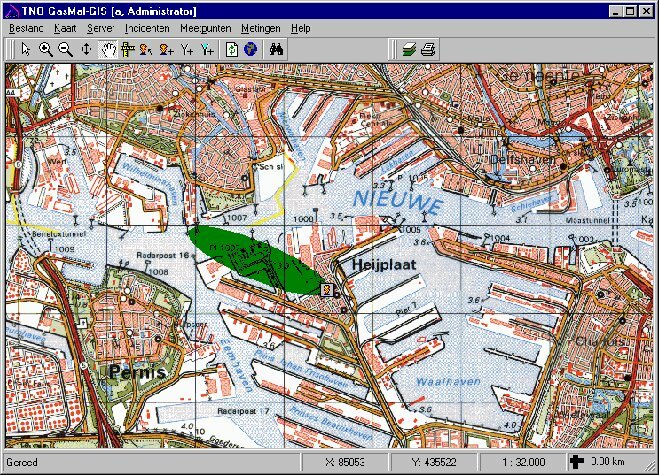 The program GasMal-GIS is a Geographical Information System that enables the user to present the templates that are determined in GasMal on digitised maps. With help of GasMal, the user gets an overview of the area that is affected by the incident in a fast and consistent way. Even when there is only limited data available about the incident the system displays the sector where the gas cloud will most likely be located. The Red Case has proved its value for the WVD organisation for over a decade since the end of the eighties. The usefulness of GasMal in methodological terms is therefore self-evident. The major advantages of the automated version are time-saving, a reduced margin of error, the possibility of displaying results directly on the map together with the presentation of other important information and the option of changing the displayed contours quickly for different chemicals and meteorological data. GasMal has the added advantage that Warning and Monitoring Experts can use their own maps. The program can work with scanned maps so that expensive digitised maps from specialised suppliers are unnecessary (although GasMal is able to work with most of these file types). The threshold for using GasMal was kept low as it ran on a Pentium 200 MHz, 32 Mb under the at that time popular operating systems Windows95, 98 and NT.